High Flowing 3.00" V-Band discharge module is now available for the GT25R, GT28R, GT28RS, GT2871R, GT3071R-WG, GT3076R-WG. ATP offers a creative and modular unit that converts the discharge side of these GT Turbos to 3.00" VBand for easy connection to any 3.00" V-Band style downpipe. 1. CNC Machined Flanges from solids on both ends for max durability. 2. Custom formed stainless transition tube offers max flow with no restrictions. 3. 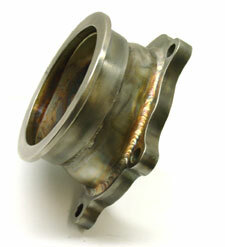 Unit has large opening for both wastegate and turbine discharges.